No matter your age face painting is fun! Face painting is a great way to add an extra element of fun to your child's party, whether its a birthday, christening, school/preschool event or even keeping happy smiles occupied at a wedding reception, Absolutely Painted Faces can provide you with you with one face painter or an entire team of experienced, professional painters. 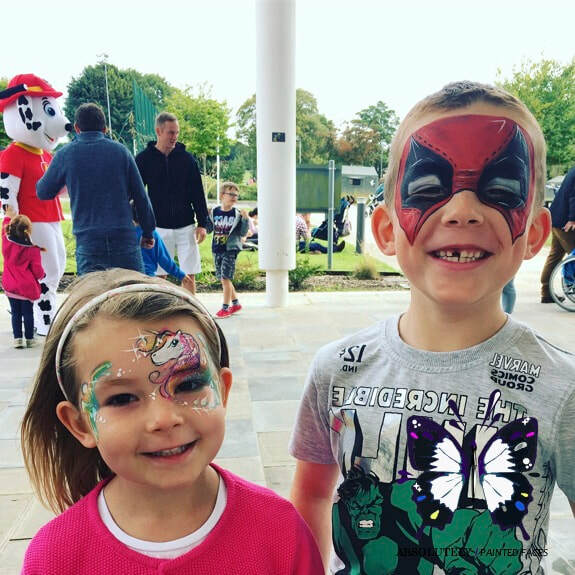 Face painters will can bring a portfolio of popular designs, characters and themes to choose from and spark ideas, any theme can be organised from Super Heroes to Pokemon! We are also all able to create designs on the day so whatever your theme just let us know. 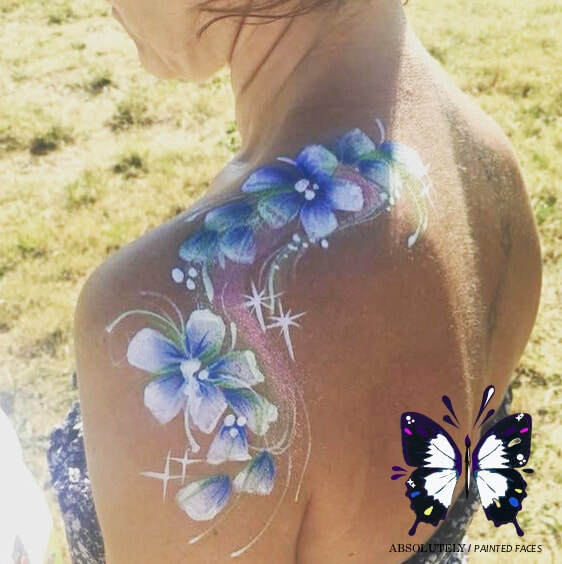 Face Painting for "Grown Ups"
From hen parties to festival wedding and birthday parties, face painting for adults has become more and more popular! 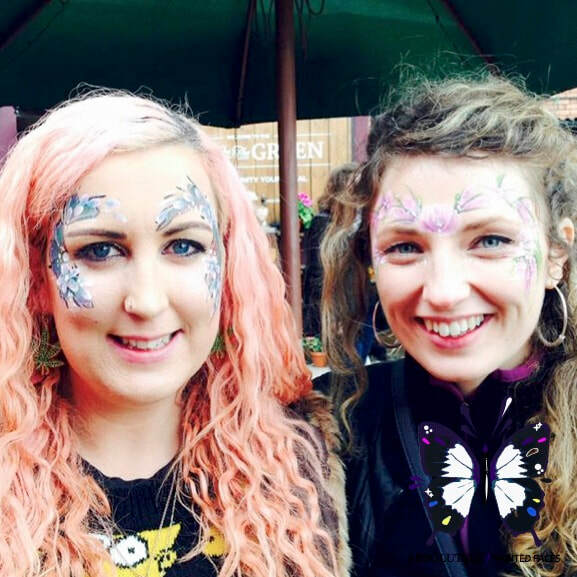 Adding a face painter to your festival themed birthday party, beer/cider festival, or even to simply glam up a girly night in, makes it so much more of an event! Ab Fab also offer body painting, with many years experience painting faces, arms, legs and even baby bumps we have the skill set and the range to create almost any look. Small or large, from shoulder details to full themed event body paints Absolutely Painted Faces can offer it all. Body painting is a great way to turn heads at a sales event, shop opening or even on the catwalk. 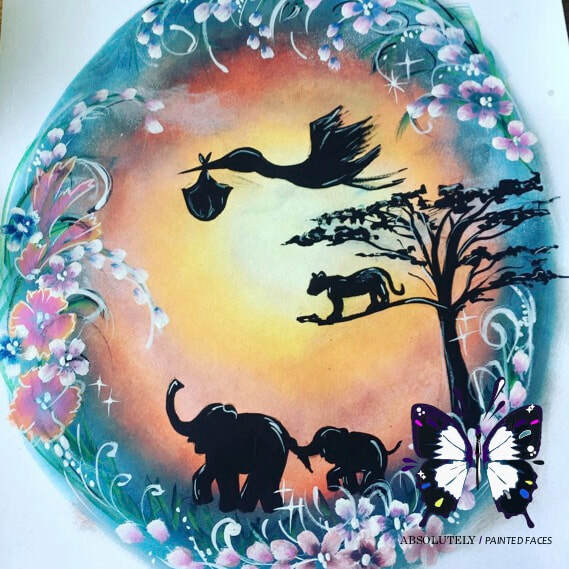 Ab Fab now offer wonderful baby bump paintings, these can be part of a baby shower with guests painted to match or for a special treat just for Mum to be. With excellent communication we will organise with the event planner to create A3 painted designs of your chosen theme prior to the booking, these are for Mum to keep to remember he special day. We have many incredible painters who are able to create a variety of designs and looks so get in touch to arrange yours today. Hygiene is very important, brushes and sponges are washed thoroughly and water changed regularly. We will not paint anyone who is suffering from a skin condition or rash on their face, some children will prefer to have an artwork on their arm or hand rather than the face. Children under 3 should not be painted as their skin is still quite sensitive, if a child is suffering from eczema or any other skin irritation it is also best they are not painted. All face paints used are made by well known, trusted and tested brands and wash off easily with warm soapy water or baby wipes. Face painters should never be left in sole care of any children whilst painting, supervision of children should always be by an appropriate member of staff or carer. Because of this a CRB check is not required.